Yeah! You made it to counting to 10. Let’s celebrate with these star shaped, heart shaped, long and bumpy, and round balloons. Count them by ones or by 2’s for an extra challenge. 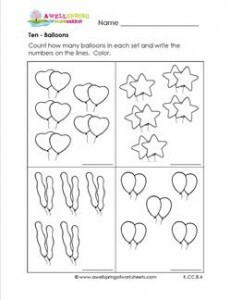 Please go to this page to see all the counting to 10 worksheets in this set.